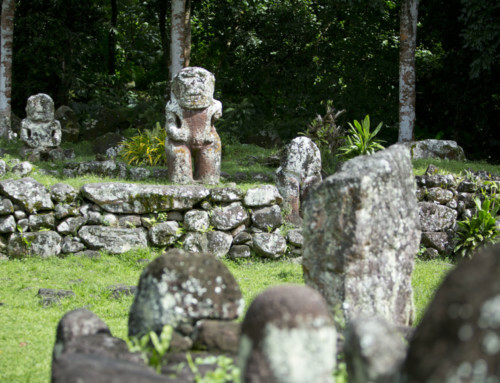 Once upon a time, in the district of Anau in Bora Bora, lived a family whose father – Haauri was one of the descendants of a royal family who owned the Marae (ancient open air Polynesian temple) of Nohono Houra. During his last days, Haauri’s behaviour had changed and he disappeared for weeks without giving any news. His wife was worried and asked her 2 children to watch him and follow him when he went fishing. All 3 of them left one morning on a canoe and went to the reef. Once they arrived, the father told his sons to stay there and to fish so that he could do whatever he wanted. He dove into the water and disappeared. At the end of their fishing session, the boys went back to the canoe but did not see their father and decided to wait for him for hours. As he didn’t show up, they returned to warn their mother and the inhabitants of the district. Then, they set out again together to look for the old man. After several hours of searching, one of the sons found a fault under the reef in which they tried to enter but they couldn’t get in because they lacked light. Several weeks went by and finally Haauri came home. Haauri did not answer and remained quiet as he was tired and his mind was elsewhere. In his hands he held two small yams. His wife decided to watch him and hid the food, when he was hungry he sought the yams but could not find them. Furious, he wanted to rejoin his wife, but could not leave the house because of the sun’s strong glare. Very weak, he asked the sacred birds “otu’u” to help him. Hundreds of birds came and waited for the night to help him. When the night came, the birds cried out their night calls. Haauri was so weak that he laid down. His wife approached him, tied him up with a cord of “purau” (Hibiscus talacius) and wrapped his face with a white “tapa” (wood fabric). At dawn, a strange scene awaited them. The man had disappeared. The “tapa” which had been used to cover him was on the branches where the sacred birds had perched. She found in their house some birds feathers. They looked for him in the village, all around the island, but no trace was found. His sons then returned to the place of the fault of the reef and they found their father’s lance close to the hole. Nowadays, it is still possible to see this crack above where the sacred birds still perch. On the land called Puaeva, you can still find some stones which miraculously survived: it is the Marae of the old man Haauri.